The Stork card is about change. You might experience anything from a change of plans to a change of residence, depending on surrounding cards. If you have been experiencing stagnation in your life, it should come to end and things should begin to move forward. However, this forward momentum could be blocked if the Stork is followed by negative cards. When describing a person, the Lenormand Stork refers to someone who is tall, often quite slim and with long legs. The Lenormand Stork Meaning in Love: The Stork card represents changes in a relationship – usually positive. You may need to move things forward, work on improving your relationship, or take some time apart. 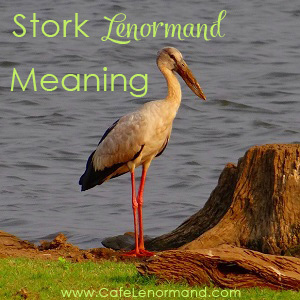 The Lenormand Stork Meaning for Career: You may experience changes in your career or job. It could be anything from a promotion to a new line of work. The Lenormand Stork Meaning in Health: The Stork usually indicates health improvements and recovery. It may also point to something involving your legs. Combined with the Lenormand Child, the Stork traditionally represents pregnancy. It doesn't matter which card comes first in this class combination. Using the Stork for Timing: The Stork traditionally represents Spring and the change of seasons. It can also represent 17 days or the 17th day of the month. If the Mountain or Lily are present, it may refer to a time period of 17 months. What areas of your life have you been wanting to change? What kind of improvements can you make in your life? Are you prepared for blocked areas of your life to begin to move forward? What have you been avoiding doing that you need to do? Hold on because things are about to go to the next level!